When I checked out Bernie Skud’s blog at <skudbe.net>, in the upper left hand corner I found my drawing of a Pacific halibut which brought back memories of a wish from my college days. I was fascinated with the old pen and ink drawings the naturalists did of fish during the early surveys of the world oceans, where they found new species which they described, preserved and cataloged. Charles Darwin’s cruise on the Beagle from 1831 to 1836 and the U.S.F.C Steamer Albatross’ explorations during 1888 are examples and I have always been interested in doing such detailed drawings. In the early part of the 1970s I was told that the new director of the International Pacific Halibut Commission (IPHC), Bernie Skud, was interested in having a detailed pen and ink drawing of the Pacific halibut, so I called him and made arrangements to discuss it. 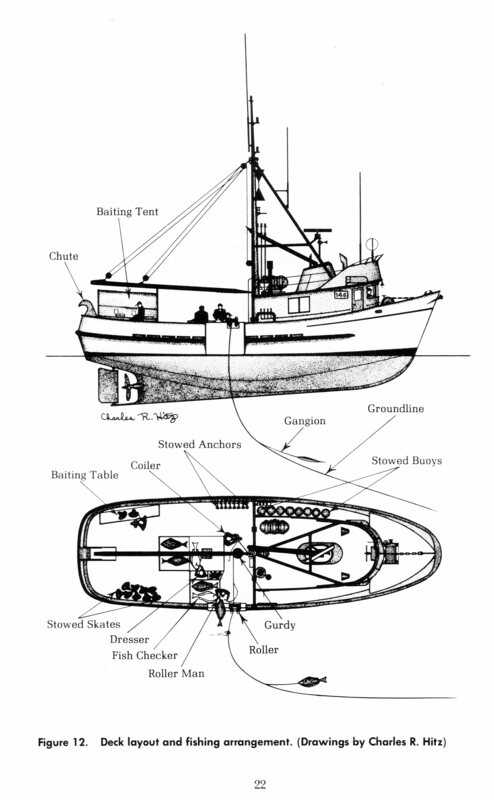 Bernie said that while there was a drawing of the Atlantic halibut, Hippoglossus hippoglossus, there was no drawing of the Pacific halibut, Hippoglossus stenolepis and could I draw one, as well as a typical halibut vessel and the gear it used in the fisheries. I said I would try. It was fun going though the pictures of the Pacific halibut, getting the proportions right and then putting a pencil drawing together for review by the halibut biologists. I remember that I was surprised at the number of minor changes they found in the details. I assumed that just as in humans there is difference between individuals it must be the same with animals. They all look alike until you look at enough of them and probably start to see the subtle individualities. Finally I got it so they all agreed on the drawing and I completed it by inking. The vessel drawing was also a fascinating project. I decided to draw an Alaskan seiner or combination vessel instead of the halibut schooner or larger sardine seiner. The deck arrangement and personnel are similar on all the vessels. 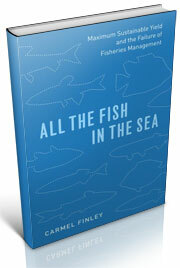 When hauling they run parallel and left of the long line as the fish are taken aboard and placed in the checker. I had fortunately learned that a live halibut laid in the checker with the white side up is docile, whereas one with the dark side up can be wild. When I was at sea on the Cobb in the Gulf of Alaska on one of my earlier trips, I had the job of tagging halibut. A large live halibut was laying in the checker dark side up and I started to straddle it to place a tag on its gill cover when Connie, a Norwegian halibut fisherman part of the Cobb’s crew said; “Bob, if you want to keep your manhood I would suggest that you stand to one side of it.” I fortunately did, after which the halibut had a fit. When Connie rolled it over it quieted down and he rubbed its belly. I swore it purred. So in the vessel drawing I drew the fish the dresser was preparing on the hatch cover with the white side up. Drawing the different parts of the deck gear was interesting, especially how the hook was attached to the end of the gangion and how the other end was joined to the groundline. 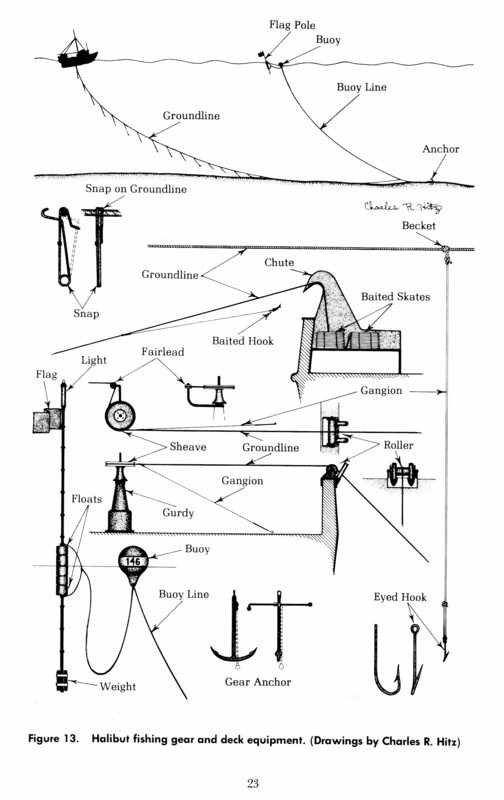 The rest of the equipment apparently was drawn correctly because it was accepted by IPHC. Now the fishery has changed, with a more complex system of automated longlining where the hooks are baited mechanically and the gear is set and retrieved by more efficient gear. 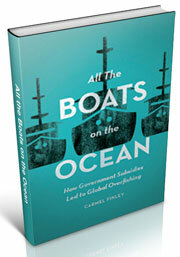 The vessels are larger and are enclosed, protecting the crew and machinery. 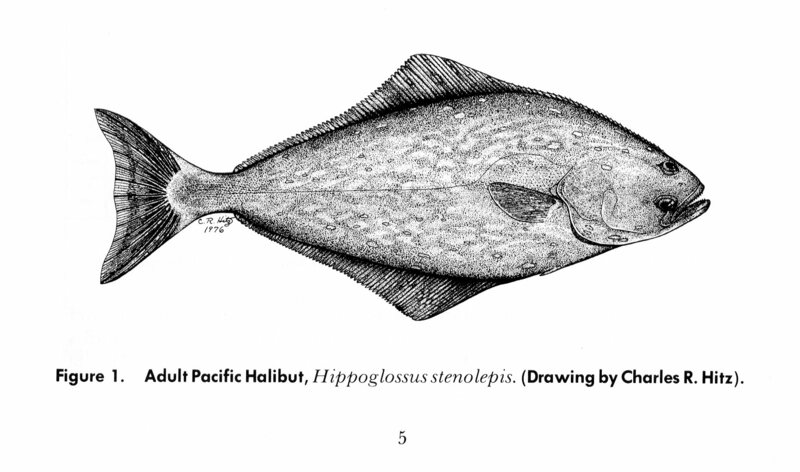 The drawings were first published in the IPHC issue of “The Pacific Halibut: Biology, Fishery, and Management” Technical Report No. 16 (Revision of No. 6) Seattle, Washington 1978. They again appeared in the 1987 revision of Technical Report No. 22. In 1998 revision, No. 40, the individual deck equipment was not included. 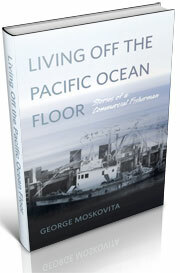 This entry was posted in boat building, Exploratory Fishing Base, History of Science, History of Technology, Maritime History, Ocean fishing, Pacific Fishing History Project and tagged Bernie Skud, groundfish, halibut, History of Science, International Pacific Halibut Commission, Pacific Fishery History Project, Pacific Halibut. Bookmark the permalink.